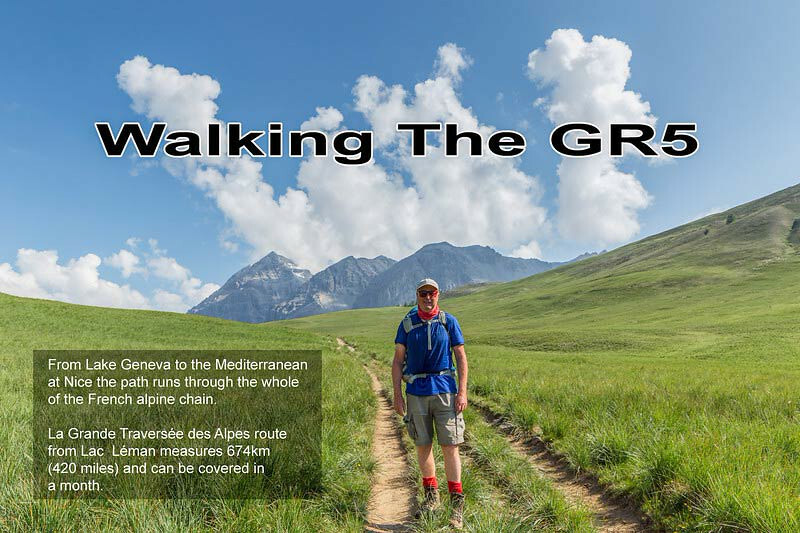 The GR5 is part of the European long distance path (E2) from The Netherlands via the Vosges and Jura ranges. The northern section of the E2 runs through England, Scotland and Northern Ireland. The classic southern section is through the alps along the backbone of France and its borders with Switzerland and Italy. 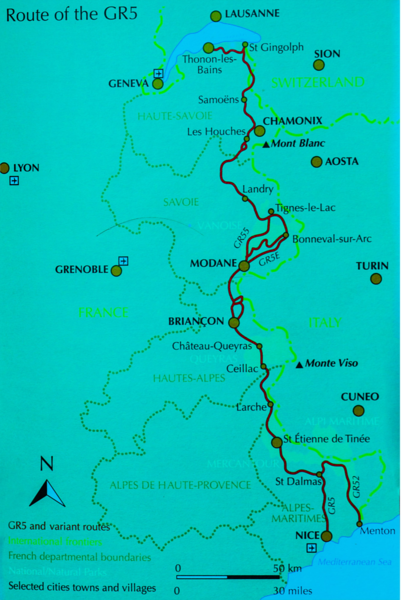 The map shown here is from the book by Paddy Dillon - The GR5 Trail (A Cicerone Guide) The French Alps: Geneva to The Mediterranean. It was updated in March 2013. Mountain conditions can be variable but we were lucky to enjoy virtually endless sunshine. The couple of thunder storms and heavy rain occurred at night with blue skies again next morning. We encountered plenty of snow on the high cols but everywhere was passable with care. In these conditions, this is one of the best walking trails in the world. Due to the possibility of late snow or bad weather conditions it is important to only book accommodation in the mountain huts and gite d’etaps about two to three days ahead, as it could become necessary to change the planned itinerary. However it is also important to be aware of your intended location at each week-end as these can be busy with more French walkers and booking therefore becomes more essential. Most of the CAF huts (club alpin français) now require an on-line booking with a credit card deposit.